I really like this one, probably because it has all the elements of a good Minder episode - a con, a tough nasty villain, old bill, a good looking girl (Natalie Roles) and of course a good punch up at the end! What else does a Minder episode need than this? Perhaps a few scenes at a hotel or even a token Welshman? It has those too! Robert Blythe who played Councillor Griffiths in this one was previously the night porter at the hotel Terry takes Yorkie to in 'The Beer Hunter'. This is a great episode that would have worked well in the Terry years I think. "You've never fully comprehended the complex infrastructure of the free market system have you Ray?" "Mr Morley, can I be honest with you? This particular machine does not play by the Marquis of Queensberry Rules if you catch my drift"
and to the old lady who asks "Mind if I have a flutter?" Arthur replies "Yes I do, go away!" "To accept a man's final offer without an approrpiate counteroffer would be an insult to his bargaining skills. Businessmen such as us thrive on the haggle." "Is this a private visit or can anyone get had over?" Dave is on top form, being a bit naive lugging 200 quids worth of 'slummy' down to the Irish Trust Bank, completely unaware of its origin. The scenes in the Winchester where Dave counts the coins into the pint glass and subsequently opens up the machine to discover the dodgy coins are not in the script. The term "opportunites" is played out many times too. Arthur & Ray genuinely seem to enjoy themselves at the fair on the two occasions we see them there in the daytime. When Alexie says to Arthur "It pays to advertise", Arthur replies with the phrase "indubitably", which I must confess is not a term I use or hear much everyday. Alexie also mentions "600 in crisp Wellingtons" to Arthur - Wellington boot? Loot? I don't know this one. Alexie Nolan is a very nasty and dogy piece of work is played very well by Sean McGinley. Arthur getting out of the Jag and walking through the hotel at the end is certainly very good fun to watch. 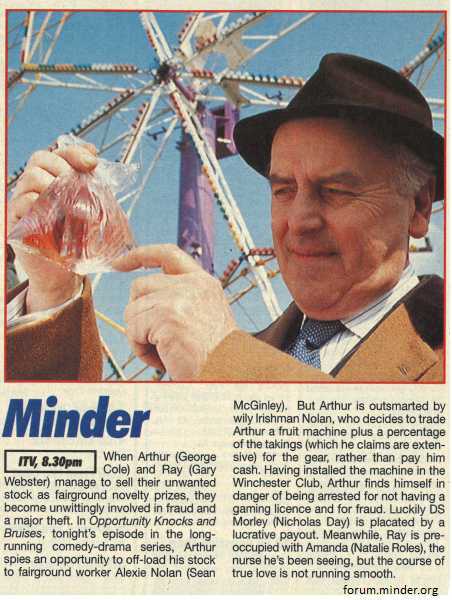 Morley clearly loves getting one over on Arthur twice in this episode - both at the Winchester Club when the the fruit machine pays out and at the charity event. He also seems to let go the fact the machine is rigged in 'the interests of charity'. Ray on top form as a minder too giving Alexie a pasting at the end. Love it! 9/10 from me! Decent episode. Good mix of the comic and gritty aspects of the show. Another top episode. Strolls along at a nice pace and comes to life at the end with a great fight sequence between Ray & Dolan, one of the best fight scenes in Minder for me. Even the end when Morley is sitting with a cigar and drink in hand watching Arthur fill the machine with cash thinking the stolen loot was still inside was a very good ending, not often Arthur gets one pulled over on him. I loved seeing Arthur 'walk' into the hotel weighed down with 50 pence coins, top stuff. I thought us lads were in for a treat when Ray went to the nurses home and Amanda was looking like she was about to flash her modesty, but alas, not to be, that was one thing that did change during the RD years, and a good thing really. It would be a few years later that the actress would pop up as Debbie McAllister in another forum favourite 'The Bill'. A fun episode and as jno mentioned Arthur has some great lines. GC has the best dialogue in this than in most GW years. I love the atmosphere of the creeping around the fair at night and the laughs on the ghost train. Alexei is a good villain, and you know that his family would be genuinely not people to mess with. Morley aa usual is a great character, and in series 9 he has become more comedic. Good job Alexei’s knife had disappeared by the time the fight happened! Great fight scene in the toilets.